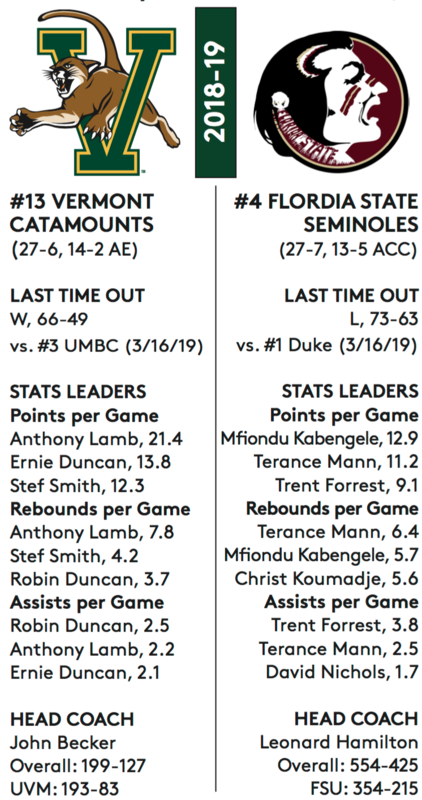 When John Becker and Anthony Lamb talk about the University of Vermont’s first-round opponent in the NCAA Tournament, the coach and junior forward won’t deny the size and athleticism of the Florida State Seminoles. The two also know they have had this experience in the past. At 6-foot-6, Lamb represents the tallest player in Vermont’s starting lineup. He will face a Seminoles five that features Christ Koumadje (7-foot-4), Phil Cofer (6-foot-8) and Terance Mann (6-foot-7). “We haven’t faced a team as long or athletic as them,” Lamb said during Wednesday’s press conference from the XL Center in Hartford, Connecticut. “I think it’s our job to understand that and go into the game, being prepared for that. Lamb led Vermont and the America East scoring 21.4 points per game (27th Division I) this past season. The conference player of the year ranks 22nd in the country with 238 field goals made. He grabbed 7.8 rebounds and handed out 2.2 assists. With wins over Virginia and Virginia Tech, Florida State advanced to Saturday’s finals of the Atlantic Coast Conference tournament where they lost to Duke, the overall top seed of the NCAA Tournament. Earlier this season, Lamb scored 25 points in an 86-78 loss to Louisville. The Greece Athena graduate connected on 9-of-15 shots from the floor including hitting both of his 3-point attempts. Four days prior to that, he scored 24 in an 84-68 loss to Kansas. After that game, Kansas head coach Bill Self didn’t hold back his praise. 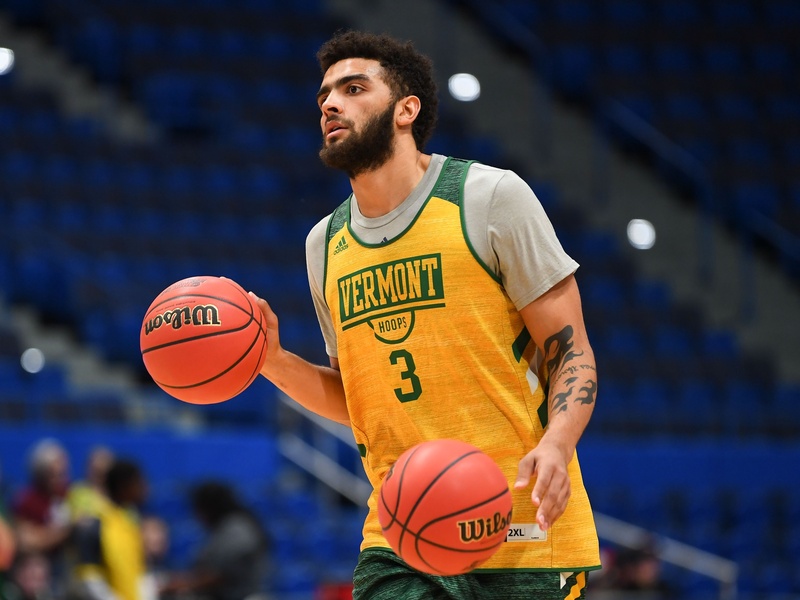 Lamb’s ability to hit from the outside will play a pivotal role in Vermont’s success Thursday on the offensive end. The junior forward connected on 47 of 127 (37 percent) attempts from 3-point land this season. Florida State limited their three opponents in the ACC Tournament to 19.3 percent from long-range. Lamb, though, presents a front court threat who can draw Florida State’s bigs away from the basket. “Anthony’s been amazing this year,” Becker added. “You know, his growth as a player, he’s really — his perimeter skills have really improved in three-point shot, it really made him a hard cover. This will be Lamb’s second appearance in the NCAA Tournament. 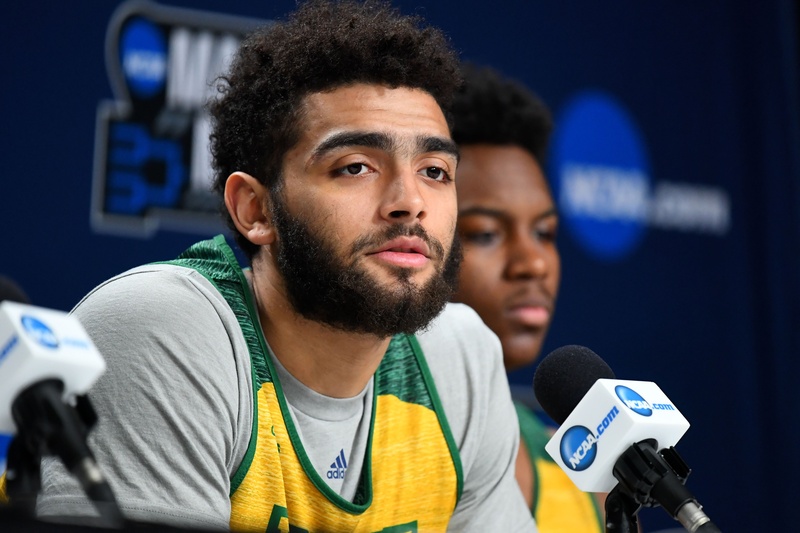 In 2017 as a freshman, he scored 20 points and grabbed nine rebounds in Vermont’s 80-70 loss to Purdue in first round Midwest Region action. When: Thursday, March 21st – 2 PM. Graphic courtesy of University of Vermont Athletic Communications.